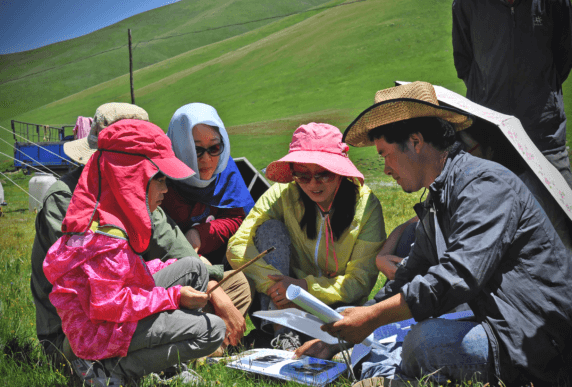 As part of his village’s ecotourism initiative, village leader Donchi teaches visitors from the cities about the grasslands and his community’s way of life. A few months ago, the people of Karlsi, a small village high in China’s Tibetan Plateau, refused a lucrative offer from a construction firm eager to build roads and tunnels across the mountain grasslands. 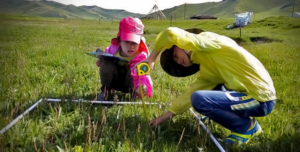 I first met Donchi and the other villagers six years ago, when I was the director of Pacific Environment’s partner, Green Camel Bell, a local environmental group based in Lanzhou, Gansu Province. Nomadic herders have been living for centuries on the Tibetan plateau. We visited them there because we wanted to help protect the grasslands, which were being destroyed by climate change, overgrazing, and proliferating rodents, in addition to looming development threats like the one I described above. We started partnering with the village to design a more sustainable future for them. After more than 60 trainings over six years, protecting the grasslands has again become a way of life in Karlsi. For example, rather than trying to raise their incomes by increasing yak and sheep herds, which would only have worsened the problems ailing the grasslands, the villagers created sustainable alternatives. 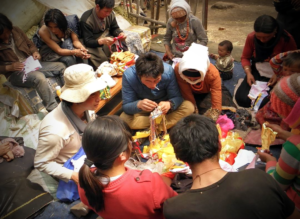 They reinvigorated traditional textile work, developed ecotourism, established a livestock cooperative, and elected a five-member committee to manage the village’s natural resources and waste. As a result, the villagers reduced the number of yaks and sheep. And incomes are on the rise. Herders are now selling their livestock, wool, milk, and cheese directly to market via the village cooperative, resulting in fewer transaction costs and higher profit. Along the way, the cooperative is educating consumers about the value of sustainably harvested food and the higher price tag it deserves. Pacific Environment provided critical funding and expertise to support Green Camel Bell’s work with the Karlsi villagers. This past summer, the Karlsi community welcomed its first ecotourists. Promoted by Green Camel Bell via social media, the three-day event immersed 46 parents and children from cities like Lanzhou and Beijing in grasslands culture. Even though I’m no longer the director of Green Camel Bell, I jumped at the opportunity to return to beautiful Karlsi with the first group of ecotourists. Sleeping in nomadic tents, eating traditional foods, hiking the mountains on guided tours, and collecting yak dung allowed me and my fellow tourists to forge an emotional connection to the land and its people. And we all took home a greater awareness of the threats to this fragile environment. At the same time, this event added 15 percent to each family’s annual income—powerful evidence that sustainable practices can increase local prosperity. I believe the community was able to protect its cultural heritage and stand up to the industrial developers because they had a choice. And they chose their own path of development. In partnership with Green Camel Bell, the 43 villagers had spent the past six years thoughtfully developing sustainable alternatives to industrial infrastructure development and other threats to the grasslands on which their livelihoods depend. To me, the villagers’ success illustrates beautifully how, with the right training and support, we can empower people to develop sustainable ways of life that honor cultural traditions, nourish people, and protect the land.